• The group is neither Christian nor Muslim but practice the faith Yazidism, which incorporates elements of both. • There are between 70,000 and 500,000 living primarily in Iraq, Turkey and Syria. • A leader of the group Yazidis in Arizona estimates that there are 120 in the state. PHOENIX – Joined by a Republican congressman, Arizonans who are members of an ethnic and religious group from the Middle East said Thursday the United States isn’t doing enough to stop violence perpetrated by the Islamic State group. U.S. Rep. Trent Franks, R-Glendale, called the news conference in front of the State Capitol to address what he termed the unwillingness of the Obama administration to stop atrocities against non-Sunni groups, including Yazidis, by ISIS, also referred to as ISIL. Franks said that he was one of 55 lawmakers who petitioned Secretary of State John Kerry to provide aid to Christian minorities in Iraq. Yazidis are an ethnic and religious group that has been a small but significant part of the Middle East for centuries, with historical populations in Syria, Iran and Iraq, among other places. There are around 120 Yazidis across Arizona, most of whom have relatives in Middle East, Jundi said. They are not Muslim, and because of that they have suffered from religious persecution by ISIL forces, being forced to convert to Islam or be executed, Jundi said. Jundi said that nearly 600,000 Yazidis have been displaced and hundreds more murdered during ISIL’s campaign in Iraq and Syria. Though President Barack Obama has approved airstrikes and special operations against ISIL, the United States has yet approved combat troops in Iraq. The decision to withhold troops has drawn criticism from Franks and other Republican lawmakers. Franks said the president’s decision to withdraw ground troops from Iraq in 2011 led to the current “targeted religious cleansing” that ISIL is responsible for. “I believe that President Obama owes George Bush an apology, along with the men and women who freed Iraq, and then watched their blood-bought gains evaporate while this president stood by with a golf club in his hands as women and children were beheaded, crucified, raped and sold into slavery,” Franks said. “We will never defeat ISIS until we confront them on a strategic level,” Franks said. 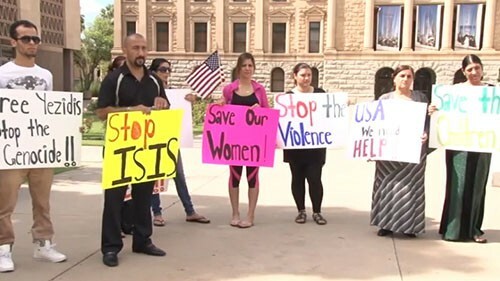 Arizona Congressman Ted Franks met with members of the Yazidi community in Phoenix, who are demanding more action against the Islamic State group. Reporter Analise Ortiz went to the conference. 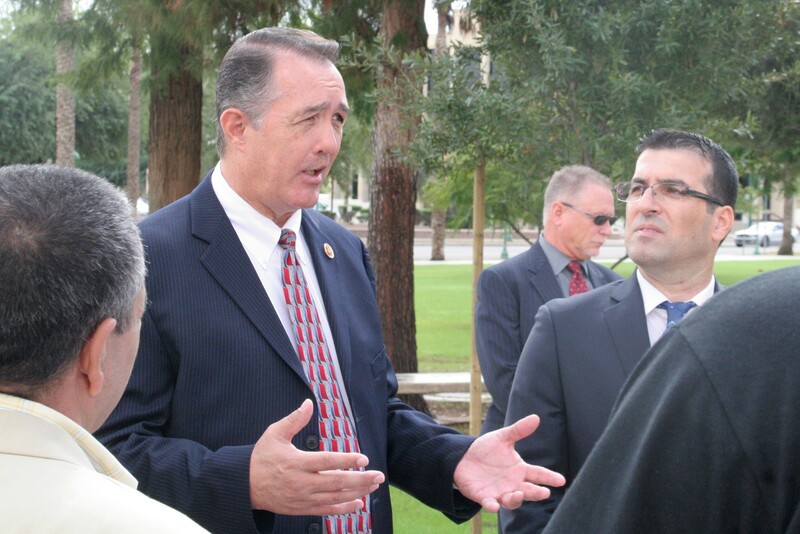 U.S. Rep. Trent Franks talks with Arizonans who are members of a Middle Eastern group called the Yazidis. Franks and members of the group held a news conference Thursday to say the Obama administration isn't doing enough to protect Yazidis and other non-Muslim groups from the Islamic State group.